The Census Bureau released the 2009 poverty data today, revealing the largest number of people in poverty on record. Poverty impairs children’s emotional, intellectual, and physical development, and ends up costing our nation billions a year in lost productivity and increased health care costs. But poverty is also a problem we can solve. We must be certain to tackle poverty’s root causes as we rebuild our economy, creating more decent-wage jobs, strengthening work supports, and investing in children early so that everyone can participate in the economy. As the numbers will show, we cannot afford inaction. 20.7 percent: U.S. overall child poverty rate in 2009. 1.4 million: Number of children who fell into poverty last year. 35.7 percent: Percentage of African-American children living in poverty. 33.1 percent: Percentage of Hispanic children living in poverty. 17.7 percent: Percentage of white children living in poverty. 14 percent: Percentage of Asian children living in poverty. 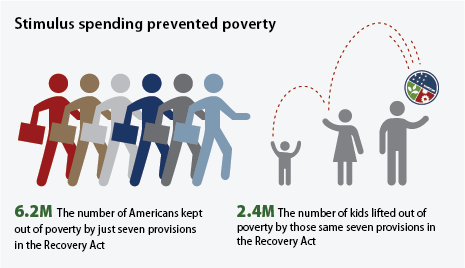 6.2 million: The number of Americans kept out of poverty by just seven provisions in the Recovery Act. 2.4 million: The number of kids lifted out of poverty by those same seven provisions in the Recovery Act. $500 billion: A low-bound estimate of the amount child poverty cost the economy in 2007 due to lost productivity and increased expenditures in health care and criminal justice. And that was even before the Great Recession. 4 percent: The estimated loss of U.S. gross domestic product due to child poverty. Billions of dollars more: What the increased child poverty and parental and youth unemployment due to the Great Recession will generate in additional economic and fiscal losses over time. 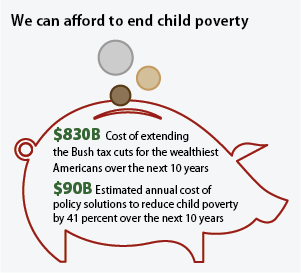 $90 billion: Estimated annual cost of policy solutions to reduce child poverty by 41 percent over the next 10 years. $830 billion: Cost of extending the Bush tax cuts for the wealthiest Americans over the next 10 years. 57 percent: Percentage of Americans who think the federal government should do more to reduce poverty. Failure to invest in poverty-reduction will exacerbate children and youth’s long-term scarring from this recession, may reduce the value of economic output over time, and worsen the fiscal outlook for states and the federal government. Young people—America’s next generation—have borne many of this recession’s costs, and greater poverty could worsen their educational attainment, earnings, health, and perhaps even law-breaking. All these will have ripple effects the U.S. economy and budget outlook as a whole for many years. Sensible, short-term public investments in children and youth are needed in order to reduce the Great Recession’s long-term economic and fiscal repercussions. Some of these investments would bolster income supports and employment among poor and unemployed parents while others would directly serve children and youth most in need. How does poverty affect children’s economic prospects? Low-income kids start to fall behind in cognitive development at a young age and have difficulty catching up. They fall further behind when they attend lower-quality public schools. 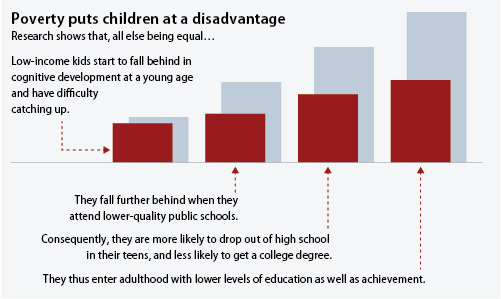 Consequently, they are more likely to drop out of high school in their teens, and less likely to get a college degree. They thus enter adulthood with lower levels of education as well as achievement. Their health also suffers—gaps in wellness appear early in poor children’s lives and only widen over time. Lower education and worse health, among other factors such as discrimination and weaker labor-market contacts result in lower levels of employment and earnings over their working lives. At least some of those with the lowest levels of employment are more likely to become single parents or engage in crime and become incarcerated. All this adds up to: lower productivity, less tax revenues, and larger health care and criminal justice costs. The grand total: Child poverty costs us at least $500 billion a year and the cost is going up due to increased hardship facing children and young adults in the Great Recession.